Outlaw 10.5 is an exciting class for several reasons, most of which fall into the classic exciting heads up class formula  lots of power, not-so-much tire. The modern-day Outlaw 10.5 racer must be able to figure out what was long thought to be impossible, and thats how to harness two or three-thousand horsepower on a 10.5W tire, and make it go in a straight line. One of the bests at this is Tim Lynch, but even the best sometimes slip  literally. At the recent Huntsville ORSCA race, Tim Lynch and his Twin-Turbocharged big-block Mustang gave us one of the craziest rides that weve seen in a while. After building boost on the line, Tim staged the car and left as soon as the lights dropped. In typical Lynch/Petty fashion, the car leapt from the line and began pouring on the newfound power from the custom ProLine Racing engine. However, in a rarely seen sight from the team, at about 330 feet out, the cars power came in a little too fast, and broke the tires loose, sending the car right at the wall. Showcasing some impressive driving skills, Lynch managed to rotate the car 90 degrees the opposite way to avoid the wall, barely clipping the wheelie bars. The car continued to fight Lynch, swerving back and forth off of the side of the track. Eventually, Lynch straightened the car out with the only damage being to the wheelie bars. Its rare that an Outlaw 10.5 car can get that out of control and then roll away in basically 100% shape. The impressive driving skills of Tim Lynch and probably a good amount of luck combined to create what is definitely one of the close calls of the month. This entry was written by by CraigB. 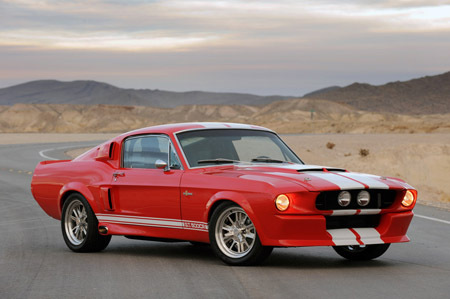 (Stang TV Forums) and posted here on Wednesday, August 5th, 2009 at 7:45 am and is filed under Vintage Mustangs. This article was not written by us, rather gathered using RSS feeds listed here. We take no credit for this article. Both comments and pings are currently closed.